A multivitamin for kids from 6 months to 12 years old can provide good insurance for your child’s nutritional needs in case they are lacking any key vitamins or minerals from their diet. While you are pregnant or nursing you should consider a prenatal vitamin to ensure your baby is getting adequate nutrition. While gummy and chewable multivitamins are are easier for a child to take, you should be aware that according to labdoor.com they measured at 54% less vitamin content and 70% less minerals content versus standard multivitamins. Therefore liquid supplements tend to provide more nutritional value than a gummy or chewable version for kids. Below we reveal the best kid’s multivitamin and review the top 6 multivitamins for kids including liquid and chewable products. Buyers should be aware that the prices listed were the prices at time of publication and are subject to change. Amazon also offers subscription rates on many of these items for a pretty significant discount. At the bottom of this article we also have a comparison chart of each multivitamin with their amounts of each primary vitamin or mineral*. With this you can easily compare one kid’s multivitamin versus another. We also have a list of ingredients if you want to look into each product in even more detail. We chose the Child Life Essentials Multivitamin & Mineral as the best multivitamin for kids. This liquid supplement comes in an 8-ounce bottle for a price of $15.25 with a price per serving of $0.64 for a serving size of 2 teaspoons. It is formulated to provide the optimal dosage of all essential vitamins and minerals for infants and children from 6 months to 12 years old. Although some have complained about the taste, we found the majority of kids liked the orange-mango flavor. Child Life only uses the highest quality ingredients which contain NO gluten, milk, eggs, wheat, yeast, peanuts, fish, nor any artificial flavorings, colors, or sweeteners. Dr. Mercola Chewable Multivitamin for Kids is a fruit flavored chewable tablet that actually scored the highest quality rating from labdoor.com. It costs $19.97 for a bottle of 60 tablets with price per serving of $0.67 for 2 tablets each day. This supplement is designed to provide essential vitamins and nutrients, including chelated minerals, for children 4 years old and up. It also does not include anything, like iron, that when taken in large doses can actually harm kids. As you know kids can be picky eaters and the biggest negative for these tablet seems to be the taste. Many parents have said there children would not take them, although some reviewers did say their kids liked them. 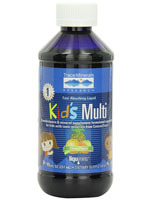 Trace Minerals Kids Multivitamin is a citrus punch flavored liquid supplement with a price of $14.50 for an 8-ounce bottle or price per serving of $0.30 from 1 teaspoon. It is formulated to provide vitamins, trace minerals, and key nutrients children from 2 to 12 years old need for optimal health. It also does not contain any known allergens. Again like most kids vitamins this one can be a challenge for you to get your child to take. Many people have complained about the smell, and if it smells bad many kids won’t even attempt to take it. 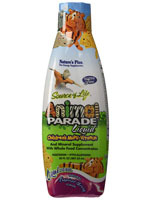 Nature’s Plus Animal Parade Liquid Multi-Vitamin comes in a 30-ounce bottle for a price of $24.95 or price per serving of $0.42 for one tablespoon. This vegetarian, hypo-allergenic supplement has a tropical berry flavor that many, but not all, kids seem to enjoy. It includes 100% of the daily serving for many vitamins including B and C, however it only contains trace minerals. Animal Parade Liquid Multi-Vitamin does have 2.5 mg of iron which makes it a good choice for any parent looking to supplement iron to their childs diet. Just be sure to keep the bottle out of reach of the child because overdosing iron can be fatal. The cheapest kid’s multivitamin is the Rainbow Light Kid’s One MultiStars Chewable Food Based Multivitamin which sells for $19.95 or a price per serving of just $0.22. Each bottle contains 90 chewable tablets with a serving size of just 1 tablet per day. It is a complete form of bio-available vitamins and minerals with probiotics to held support normal digestion. All ingredients are 100% natural and free from artificial colors, flavors, sweeteners, and preservatives. The Rainbow Light Kids One MultiStars are also allergen free. Each Rainbow Light Kid’s One chewable contains 5 mg of iron. So again keep this bottle out of the reach of children because they can overdose on iron. We think the best gummy multivitamin for kids is the SmartyPants Kids Complete with a price of $17.95 or price per serving of $0.60 per 4 gummies. They are the best-selling multivitamin for kids on Amazon. These are made from non-GMO, natural ingredients and contain no high fructose corn syrup; instead they add organic cane sugar. 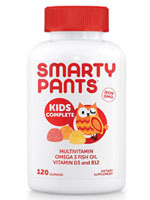 The SmartyPants Kids Complete only has 100% or more of the daily value for just two vitamins – D and B12. So it provides less nutrients per serving compared to the other products on this list. However, it is also one of the few children multivitamins that contain iodine, omega 3 EPA, and DHA. If you have trouble getting your kids to take their vitamins then we recommend you try this SmartyPants product, although gummies tend to provide less nutrition than other forms of a multivitamin. 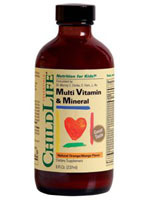 ChildLife Essentials Multivitamin & Mineral 8.8 $15.25 8 fl oz For infants 6 months to 1 yr: 1 teaspoon daily. For children 1 to 4 yrs: 1-2 teaspoons daily. For children 4 to 12 yrs: 2-3 teaspoons daily. 2 teaspoons 24 $0.64 No No No 1700 IU 34% 135 mg 225% 275 IU 69% 20 IU 67% 0 0% 2 mg 133% 2 mg 118% 10 mg 50% 2 mg 100% 135 mcg 34% 55 mg 6% 15 mg 4% 5 mg 33% 35 mcg 50% 0 0% Vitamin A (as Vitamin A Palmitate and Beta Carotene) 1700 IU, Vitamin C (as Ascorbic Acid) 135 mg, Vitamin D3 (as Cholecalciferol) 275 IU, Vitamin E (d-alpha-tocopheryl acetate) 20 IU, Thiamin (as Thiamin Hydrochloride) 2 mg, Riboflavin (as Riboflavin-5-Phosphate) 2 mg, Niacin (as Niacinamide) 10 mg, Vitamin B6 (as Pyridoxine Hydrochloride) 2 mg, Folic Acid 135 mcg, Vitamin B12 (as Cyanocobalamin) 6 mcg, Biotin (as d-Biotin) 65 mcg, Pantothenic Acid (as d-Panthenol) 7 mg, Calcium (as Calcium Lactate) 55 mg, Iodine (as Potassium Iodide) 50 mcg, Magnesium (as Magnesium Lactate) 15 mg, Zinc (as Zinc Gluconate) 5 mg, Selenium (as L-Selenomethionine) 35 mcg, Manganese (as Manganese Gluconate) 1.5 mg, Chromium (as Chromium Polynicotinate) 7 mcg, Potassium (as Potassium Citrate) 15 mg, Inositol 20 mg, Choline Bitartrate 20 mg; Other Ingredients: Purified water, fructose, natural flavors, citric acid, xanthan gum, potassium sorbate, and grapefruit seed extract. 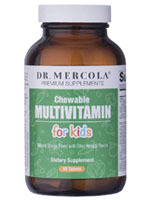 Dr. Mercola Chewable Multivitamin for Kids 8.8 $19.97 60 Take 2 chewables daily. 2 chewables 30 $0.67 Yes No No 1000 IU 20% 250 mg 417% 2000 IU 500% 30 IU 100% 0 0% 1.5 mg 100% 1.7 mg 100% 20 mg 100% 2 mg 100% 400 mcg 100% 100 mcg 10% 40 mcg 10% 3 mcg 20% 20 mcg 29% 0 0% Vitamin A (from Beta-Carotene) 1,000 IU, Vitamin C (as Niacinamide, Magnesium Ascorbate, Calcium Ascorbate) 250 mg, Vitamin D (Vitamin D3) (as Cholecalciferol) 2, 000 IU, Vitamin E (as D-Alpha-Tocopheryl Succinate with Mixed Tocopherols) 30 IU, Thiamine (Vitamin B1) (as Thiamine Pyrophosphate) 1.5 mg, Riboflavin (Vitamin B2) (as Riboflavin-5′-Phosphate) 1.7 mg, Niacin (Vitamin B3) (as Niacinamide Ascorbate) 20 mg, Vitamin B6 (as Pyridoxal-5′-Phosphate) 2 mg, Folate (Vitamin B9) (as Metafolin (from (6S)-5-Methyltetrahydrofolic Acid [Calcium Salt]) 400 mcg, Vitamin B12 (as Methylcobalamin) 6 mcg, Biotin 300 mcg, Pantothenic Acid (Vitamin B5) (as Calcium Pantothenate) 10 mg, Calcium (as Calcium Citrate, Calcium Ascorbate) 100 mg, Iodine (from Kelp) 15 mcg, Magnesium (from Magnesium Ascorbate, Magnesium Aspartate) 40 mg, Zinc (from Zinc Gluconate) 3 mg, Selenium (from Selenium Amino Acid Complex) 20 mcg, Copper (from Copper Bisglycinate Chelate) 0.05 mg, Manganese (from Manganese Bisglycinate Chelate) 2 mg, Chromium (from Chromium Nicotinate Glycinate Chelate) 40 mcg, Molybdenum (from Molybdenum Glycinate Chelate) 5 mcg, Citrus Bioflavonoids Complex 10 mg, Boron (from Boron Citrate) 20 mcg, Vanadium (as Vanadium Krebs Chelate) 3 mcg; Other Ingredients: Xylitol, mannitol, microcrystalline cellulose, natual flavors, ascorbyl palmitate, organic rice hull concentrate, organic stevia (leaf) extract. Trace Minerals Kids Multivitamin 8.6 $14.50 8 fl oz Kids 4-12 take 1 teaspoon, Kids 2-4 take 1/2 teaspoon 1 teaspoon 48 $0.30 No No No 2500 IU 50% 250 mg 416% 950 IU 238% 30 IU 100% 0 0% 1.5 mg 100% 1.5 mg 88% 12 mg 60% 5 mg 250% 375 mcg 94% 0 0% 3 mg < 1% 5 mg 33% 20 mcg 29% 0 0% Vitamin A (as Palmitate) 2500 IU, Vitamin C(as Ascorbic acid) 250 mg, Vitamin D3 (as Cholecalciferol) 1000 IU, Vitamin E(as d-alpha tocopherol) 30 IU, Thiamin (Vitamin B1) 1.5 mg, Riboflavin (Vitamin B2) 1.7 mg, Niacin (as Niacinamide) 15 mg, Vitamin B6(as Pyridoxine) 5 mg, Folic Acid 400 mcg, Vitamin B12(as Cyanocobalamin) 9 mcg, Biotin 75 mcg, Pantothenic Acid(as Calcium pantothenate) 10 mg, Magnesium(from ConcenTrace) 3 mg, Zinc (as Gluconate) 5 mg, Selenium (as Seleniomethionine) 10 mcg, Manganese (as Gluconate) 2 mg, Chromium (as Polynicotinate) 7 mcg, Chloride (from ConcenTrace) 7 mg, Potassium (as Citrate) 14 mg, ConcenTrace trace mineral complex 31 mg, Choline (as Bitartrate) 3 mg, Inositol 3 mg, Sulfate (from ConcenTrace) 540 mcg, PABA (Para-aminobenzoic acid) 50 mcg, Boron (from ConcenTrace) 10 mcg; Other Ingredients: Purified water, mixed fruit concentrate (pear, peach, pineapple), natural flavor blend (orange, apple), natural vegetable glycerine, citric acid, xanthan gum, potassium benzoate, potassium sorbate. Nature’s Plus Animal Parade Liquid Multi-Vitamin 8.5 $24.95 30 fl oz Take 1 tablespoon daily 1 tablespoon 60 $0.42 No No No 5000 IU 100% 60 mg 100% 400 IU 100% 30 IU 100% 0 0% 1.5 mg 100% 1.7 mg 100% 20 mg 100% 2 mg 100% 10 mcg 3% 20 mg 2% 10 mg 3% 3 mg 20% 0 0% 2.5 mg 14% Vitamin A (as palmitate, beta carotene) 5000 IU, Vitamin C (as ascorbic acid) 60 mg, Vitamin D (as ergocalciferol) 400 IU, Vitamin E (as d-alpha tocopheryl acetate) 30 IU, Thiamin (vitamin B1) (as thiamine hydrochloride) 1.5 mg, Riboflavin (vitamin B2) 1.7 mg, Niacin (as niacinamide) 20 mg, Vitamin B6 (as pyridoxine HCl) 2 mg, Folate (as folic acid) 10 mcg, Vitamin B12 (as cyanocobalamin) 6 mcg, Biotin 50 mcg, Pantothenic Acid (as calcium pantothenate) 10 mg, Calcium (as citrate) 20 mg, Iron (as gluconate) 2.5 mg, Iodine (as potassium iodide) 100 mcg, Magnesium (as citrate complex) 10 mg, Zinc (as gluconate) 3 mg, Copper (as aminoate complex/chlorophyllin) 0.05 mg, Manganese (as gluconate) 0.05 mg, Potassium (as potassium iodide) 1 mg, PABA (para-aminobenzoic acid) 400 mcg, Choline (as bitartrate) 10 mcg, Inositol 10 mcg; Other Ingredients: Water, fructose, vegetable glycerin, citric acid, natural flavors, xanthan gum, calcium carbonate, malic acid, magnesium oxide, sodium benzoate (preserves freshness), potassium sorbate (preserves freshness), natural color, pineapple fruit, apple fruit, sunflower oil, lemon bioflavonoids, rose hips (rosa canina fruit), whole brown rice, broccoli, spinach, mango fruit, carrot, West Indian cherry (malpighia glabra), papaya fruit and non-GMO maltodextrin. 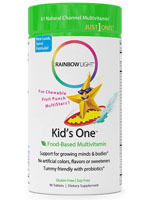 Rainbow Light Kid’s One MultiStars Multivitamin 8.4 $19.95 90 Chew 1 tablet daily 1 chewable 90 $0.22 No No Yes 4000 IU 80% 100 mg 167% 400 IU 100% 10 IU 33% 20 mcg 25% 2 mg 133% 2 mg 118% 13 mg 65% 2 mg 100% 200 mcg 50% 100 mg 10% 50 mg 13% 2.5 mg 17% 20 mcg 29% 5 mg 28% Vitamin A (as Palmitate, Beta-Carotene) 4000 IU, Vitamin C (as Ascorbic Acid) 100 mg, Vitamin D (as D3 Cholecalciferol) 400 IU, Vitamin E (as d-alpha Tocopheryl Succinate) 10 IU, Vitamin K (as Phylloquinone) 20 mcg, Vitamin B1 (as Thiamin Mononitrate) 2 mg, Riboflavin (Vitamin B2) 2 mg, Niacin (as Niacinamide) 13 mg, Vitamin B6 (as Pyridoxine) 2 mg, Folic Acid 200 mcg, Vitamin B12 (as Cyanocobalamin) 1 mcg, Biotin 25 mcg, Vitamin B5 (as Calcium Pantothenate) 4 mg, Calcium (as Carbonate) 100 mg, Iron (as Carbonyl) 5 mg, Iodine (as Kelp) 25 mcg, Magnesium (as Oxide) 50 mg, Zinc 2.5 mg, Selenium (as Amino Acid Chelate) 20 mcg, Copper (as Amino Acid Chelate) 250 mcg, Manganese (as Citrate) 1.5 mg, Chromium (as Glycinate, Dinicotinate) 30 mcg, Molybdenum (as Amino Acid Chelate) 30 mcg, Potassium (as Citrate) 15 mg, Lactobacillus Sporogenes 15 million CFU, Citrus Bioflavonoid Complex 25 mg, Organic Spirulina 10 mg; 2:1 Herbal Tonics 50 mg (equivalent to 100 mg of herbal powder): Stinging Nettle [tops], Ginger [rhizome], Peppermint [herb], German Chamomile [flowers]; Vegetable Juice Complex 12.5 mg (equivalent to 50 mg of vegetable powder): Kale, Spinach, Dandelion Greens, Beet; Other Ingredients: Natural mineral or vegetable source fructose, dextrose, stearic acid, natural pinapple flavor, silica, natural orange flavor, natural cherry flavor, citric acid, magnesium stearate. SmartyPants Kids Complete Gummy Multivitamins 8.2 $17.95 120 For children 3 or older, take 4 gummies daily. 4 gummies 30 $0.60 Yes No No 1000 IU 20% 40 mg 67% 600 IU 150% 20 IU 67% 0 0% .05 mg 3% .17 mg 10% 0 0% 1.33 mg 67% 267 mcg 67% 0 0% 0 0% 3 mg 20% 0 0% 0 0% Vitamin A (as retinyl palmitate USP) 1000 IU, Vitamin C (as ascorbic acid USP) 40 mg, Vitamin D (as cholecalciferol USP) 600 IU, Vitamin E (as d-alpha-tocopherol from sunflower oil) 20 IU, Thiamin (as thiamin mononitrate USP) 0.05 mg, Riboflavin USP 0.17 mg, Vitamin B6 (as pyridoxine hydrochloride USP) 1.33 mg, Folic Acid (as L-methylfolate, calcium salt) 267 mcg, Vitamin B12 (as methylcobalamin) 67 mcg, Biotin USP 30 mcg, Pantothenic Acid (as calcium D-calcium pantothenate USP) 1 mg, Iodine (as potassium iodide USP) 100 mcg, Zinc (as zinc citrate USP) 3 mg, Sodium 15 mg; Fish Oil 340 mg: Total Omega-3 Fatty Acids (typical values) 100 mg, EPA (Eicosapentaenoic Acid) 56 mg, DHA (Docosahexaenoic Acid) 44 mg; Choline (as choline citrate) 12 mg, Inositol FCC 20 mcg; Other Ingredients: Organic cane sugar, organic tapioca syrup, gelatin, pectin, citric acid, natural flavors (orange, lemon, strawberry, banana) and natural colors added (annatto, organic turmeric, organic black carrot juice concentrate).